Being arrested and charged with driving under the influence of alcohol or drugs does not automatically lead to a conviction. As discussed in Witness Preparation and Examination for DUI Proceedings, skilled DUI defense lawyers explain how the witness testimony brought to bear in challenging the prosecution's case is critical in generating the best results for your client. Key witnesses in DUI proceedings include law enforcement officers, fact witnesses, and expert witnesses – including toxicologists and accident reconstructionists. In this year's edition, leading criminal defense attorneys from across the country guide the reader through the myriad issues that may arise in DUI cases and which witnesses are called upon to address them. 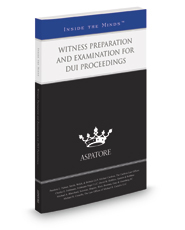 Covering a range of topics from working with experts to preparing your client for trial, these top authors analyze how to leverage witness testimony to build an effective defense. These leaders also offer proven advice for countering the state's witnesses, including cross-examining the prosecution's expert, questioning the credibility of law enforcement, and challenging forensic and field sobriety test results.